The coach of the Canadian women's soccer team has accused the United States of using "highly illegal" tactics during the Olympics. Call it a legitimate complaint. Or call it a big underdog trying to gain some sort of mental edge on the eve of a big game at the Olympics. Either way, the coach of the Canadian women's soccer team took a swipe at the Americans on Sunday, accusing the U.S. team of "highly illegal" tactics. John Herdman said the Americans go beyond the rules with their physical play on set pieces. "One of the big threats we've got to take care of, and what we've paid attention to, is the illegal marking in the box on their corners and free kicks," Herdman said. "Some of the blocking tactics, which are highly illegal, we'll keep an eye on them in the game. We've starting working on that in training without trying to injure our players." Herdman said he also hopes to "raise awareness" of the issue with game officials when Canada plays the U.S. in the semifinals on Monday at Old Trafford. "Obviously they're trying to free up a key player, but in a very illegal way. ... The U.S., it's what they do well," he said. Herdman cited an example from the Americans' victory over France in the Olympic opener, when Abby Wambach headed in a corner kick in the first half. He said U.S. defender Amy LePeilbet "took a good battering" while making a move that freed up Wambach. Canada is winless in its last 26 matches against the U.S., going 0-22-4 since a 3-0 win at the Algarve Cup in 2001. The all-time series tilts 43-3-5 in favour of the Americans. The U.S. has won the last two Olympic gold medals, while a win Monday would guarantee Canada's first Summer Games medal in a traditional team sport — not counting rowing or equestrian — since a men's basketball silver in 1936. 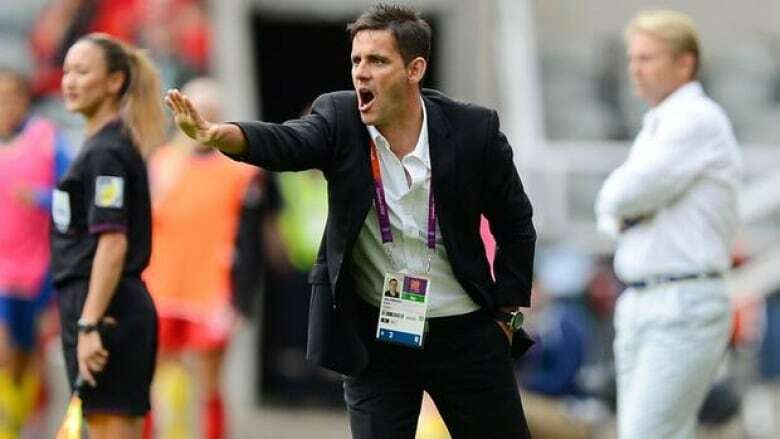 "The Olympics is all about people trying to set personal bests and breaking world records, and I think for this group of players, that's what they're dreaming about," Herdman said. "I think the Olympics is one of those special occasions where things do happen, especially in these tournament formats. ... This is what we're trying to say, you know: 'Dare to dream.' You've got to be able to get out there and see something, see a bigger vision than normal people can see."